In "Bouquet & Fountain Vertical" French tapestry we see a landscape scene of flowers and forests. A large urn of flowers is seen in the countryside, among hills, lakes and forest is seen in this Bouquet au Drape tapestry. A red drape is seen on a tree branch, an icon seen in French 17th century verdures or landscape scenes where royalty, luxury or beauty is to be accented. This work is a piece showing the expression of beauty through still life art n nature by French artists in the 17th century. 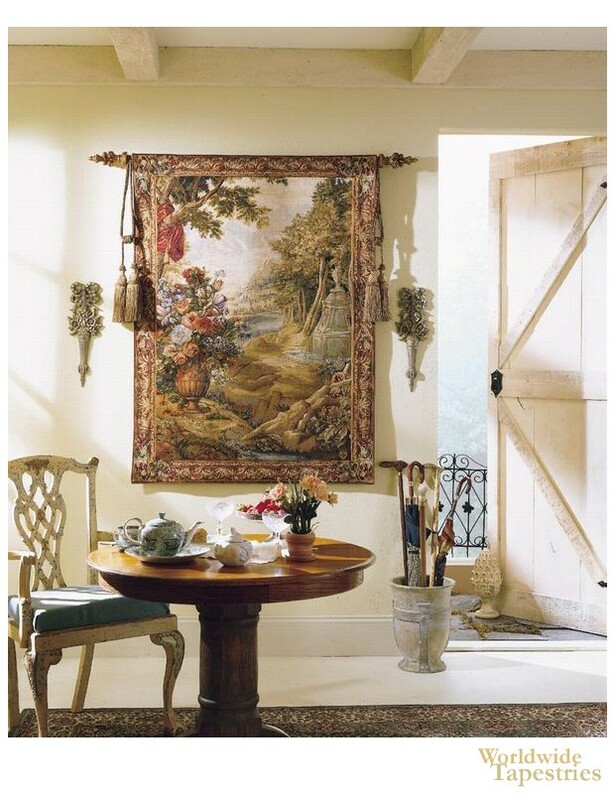 This art tapestry "Bouquet & Fountain Vertical" is backed with a lining and has a rod pocket for easy hanging. Note: tapestry rod, tassels and accessories, where pictured, are not included in the price. Dimensions: W 42" x H 58"
Currency is in US dollars, and product sizes are in inches ("). Items are shipped from the United States or United Kingdom. If shipped from the United Kingdom, this will be specified in the description above. Don't forget your tapestry rods and tassels! To find out more about our limited time Free Tassels Offer, click here! Thanks again. We have no hesitation in recommending your service to others!" But best of all the saving I made by purchasing online was great. Thankyou"
"Now all the tapestries are installed in their allotted positions, my most optimistic expectations have been confirmed. I am so delighted that a second order is already on the way!" "You have the most amazing range of tapestries to choose from, AND you ship the order free! Amazing! After only 2 weeks, my beautiful tapestry arrived! It is perfect, I just love it, and have had so many favourable comments from family and friends. I am hooked, ...and currently am awaiting delivery of my 2nd order." ...& even more surprised at the high quality of the tapestry. I am now about to place an order for another tapestry for my daughter's 18th birthday. I would highly recommend Worldwide Tapestries... Your tapestries and service is exemplary. From a very satisfied customer. "I would like to just say that the service and the quality of the tapestry I've recently purchased are exceptional. The photos are exactly as the actual physical item received. Might possibly be a returning customer, just need to see if I can find any more space in the house. Thank you for a great service."